HONG KONG, 31 May 2013 – The South China Morning Post announced the launch of “Celebrating Hong Kong” at a glittering party at Sotheby’s Gallery attended last night by Chief Executive Leung Chun-ying, former Chief Secretary and Acting Governor Sir David Akers-Jones and many of Hong Kong’s leading individuals. 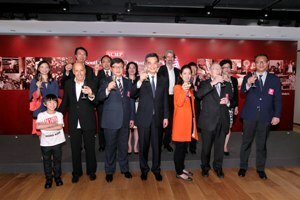 The “Celebrating Hong Kong” movement was initiated by the South China Morning Post to mark the paper’s 110th Anniversary, which takes place on 6th November this year. It is a shared celebration of the city, and aims to boost positive energy and constructive dialogue through a series of editorial features, partnership activities, ambassadorial support, topical seminars and more. An important part of the “Celebrating Hong Kong” initiative is the breadth of support it has garnered from influential individuals and companies. Committed partners include Lane Crawford, MTR, Ecovision, DHL, Agnes b, G2000, Sotheby’s, Standard Chartered Bank Hong Kong, Jaeger-LeCoultre, Cathay Pacific, Hang Seng Bank, PwC and many more. Each of the participating partners will implement a programme of their own to support the Celebrating Hong Kong theme. Influential individuals who have accepted a role as an Ambassador for the initiative include Benjamin Hung, CEO of Standard Chartered Bank Hong Kong, Jay Walder, CEO of MTR, Adrian Cheng, Executive Director of Chow Tai Fook Enterprises Ltd, Olympic cyclist Sarah Lee-Wai Sze, Chairman of Ocean Park, Allan Zeman, Pansy Ho Managing Director of Shun Tak Holdings, Professor Tsui Lap-Chee Vice Chancellor and President University of Hong Kong and the youngest ambassador, Kenny Lau, who is an accomplished child artist, aged 7. The South China Morning Post have an extensive plan of editorial features scheduled throughout the year, from stories of kindness and acts of humanity, to feats of engineering and other achievements, and features on treasured Hong Kong traditions and destinations. “The Spirit of Hong Kong Awards celebrates the individuals and groups that represent the very best of our city, but who have not had the attention they deserve. These are those that have set positive examples through their selfless acts, their hard-working contributions to society, and their heartwarming stories of achievement against the odds” said Sir David Akers-Jones, who will chair an esteemed judging panel for the awards. The Redefining Hong Kong debate series features seminars and conferences hosted by South China Morning Post and industry leaders. The debate series focuses on the opportunities and challenges that lie ahead for Hong Kong, from its role as a gateway to China, a panel chaired by Benjamin Hung, Standard Chartered’s CEO, to “The construction of a greener, more livable city“, a panel chaired by Paul Zimmerman, District Councillor. A further debate on “Hong Kong’s Path to 2017” will be chaired by the Hon. Ronald Arculli, (former Legislative Council and Executive Council member and former Chairman of the Hong Kong Exchanges and Clearing Ltd). Proceeds from the auction will support the Celebrating Hong Kong charity fund which has selected three highly respected local charities addressing age and poverty issues: Tung Wah Group of Hospitals, St James’ Settlement and the Society for Community Organisation.